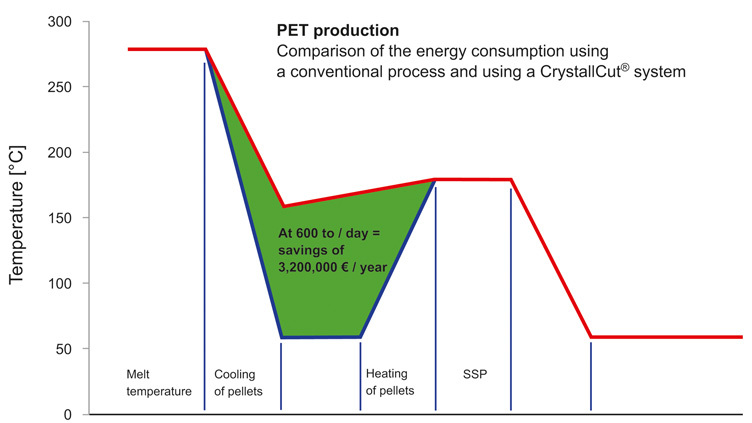 As the price for PET continues to fall, the production cost pressure for PET polymerization and PET recycling continues to grow.Thankfully, the CrystallCut® pelletizing system from BKG Bruckmann & Kreyenborg GmbH (Münster, Westphalia) offers an effective way to reduce these costs. At an average energy cost of 12 cents/kWh, energy savings of up to 15 EUR/t can be achieved. Today’s PET polymerization plants can achieve a production capacity of 600 t/day. With a throughput of 600 t/day and savings of 15 EUR/t (or 125 kWh) the daily savings can reach 9,000.00 EUR/day. This results in an annual savings of approximately 3,200,000.00 EUR/year, which represents a saving of more than 26 gigawatt hours, or 26,000 megawatt hours. Therefore, a “return on investment” can be found rather quickly. Another example – Extrusion lines which recycle PET bottle flakes and have a production capacity of 1,500 kg/h can achieve savings of more than 180 kilowatt hours or more than 1.4 cents/kg. In a 365/24 operation this equates to 190,000.00 EUR/year. 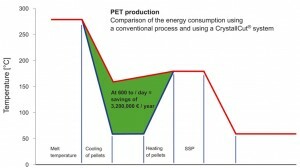 These examples of investment return can be accomplished through use of BKG’s CrystallCut® pelletizing system. Furthermore, due to the crystallization of the pellets from the inside to the outside, a better crystalline structure is achieved which in turn will save on the costs/energy to remelt the material. The CrystallCut ® system utilizes the thermal energy of the melt for crystallization. The melt is granulated by means of an underwater pelletizer and reduces the residence time in the water to a minimum. The outlet temperature of the pellets after the dryer is already at required crystallization temperature of 160-180° C. With this temperature, the pellets can be fed directly to the subsequent process. Thus, the PET is pelletized and crystallized in one single step. This results in enormous energy cost savings. These savings result from the fact that the pellets do not need to be cooled and then reheated.